This is a story about my journey last April, with one good friend of mine and three new friends. At the start of the journey, five of us accidentally met one other group, which also consisted of five people- four gentleman and one lady. At the time we might not have known each other, but we all shared the same destination: Mount Tambora. Quickly we decided to travel together. The 200th anniversary of the eruption of Mount Tambora, which fell on 11 April 2015, made Sumbawa suddenly crowded with people. Though Sumbawa itself is a popular destination for world-class surfers, it’s not the most popular tourist destination. Though for surfers it is a Mecca. To name a few of the great surf spots, in West Sumbawa, surfers usually explore around Maluk and while in Dompu, there is Lakey beach that also infamous. That month, Sumbawa was not full with surfers however, but with climbers, nature lovers and just generally tourists. We weren’t aiming to celebrate the 200 years since the last Mount Tambora eruption, but we did want to see the party a tiny bit. We arrived for the climb a few days earlier than most people. It was going to be a big one. Tambora is a volcano that is located in between Dompu and Bima, Sumbawa island. Tambora isn’t one of the top three highest volcanoes in Indonesia, but Tambora is definitely one of the specials. This is a volcano where the summit of the volcanos is not the goal. 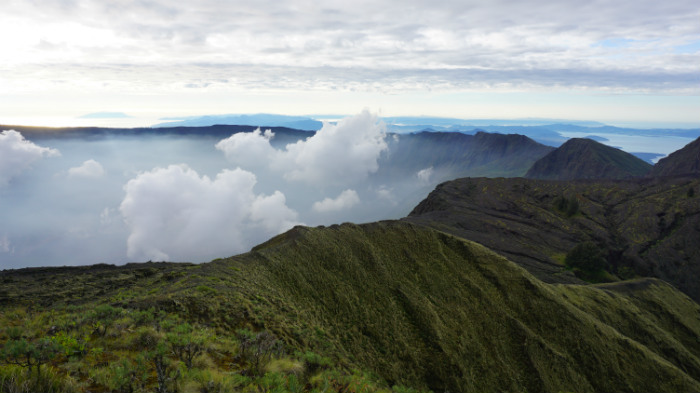 The Tambora crater is the highlight of the climb. Crater with a diameter of 6-8 km. It is geological proof that the mega-catastrophic eruptions in 1815. It actually reduced Tambora’s height, which was originally 4,200 meters above sea level, by 2,100 meters above sea level. It was said that as many as 117,000 people died because of the eruption, with the majority of victims on the island of Sumbawa, Lombok and Bali. The journey to the crater of Mount Tambora itself is quite challenging. It was a super long walk. I choose not to cheat the journey up the mountain. My friends and I chose to walk from the Pancasila village. We did not hire a motorcycle taxi from Pancasila village to the gate of the forest and did not glance to taking a jeep from Doro Canga as an option. When we climbed Tambora we did not just to the crater not the peak, and therefore ways to shorten the trip. We wanted to go all the way (and it was a long way). Though if you short of time, then a jeep from Doro Canga can be good option. We started climbing early in the day and made it to the shelter 3 around 4 pm. The paths are not too steep, they were very long. We stayed overnight at shelter 3 for two nights. The next morning at around 3, we decided to take do the summit attack. We arrived around the crater around sunrise time, it was beyond amazing. The universe seemed so on our side, it was certainly one of the best sunrises I have ever seen in my life. The grandeur of the crater is truly amazing. We enjoyed its beauty for longer than necessary really. Afterward we walked slowly to the summit, cheering and congratulating each other for making it to the summit. At the top, we enjoyed the view and had a super light chit chat with other climbers. We walk back to the shelter 3 after some time. We arrived back at the shelter 3 almost at lunch time. We chilled, uninstalled the tent, packing stuff and had lunch together and just relaxing. Then we started the journey down to the Pancasila village at 1 pm. The trip back to Pancasila Village was very tiring and very long! It reminded me of my long journey from Segara Anakan back to the basecamp on my Rinjani trip years back. We finally arrived at the village of Pancasila at 9 pm. Exhausted, but pretty much happy because we made it as a team and we all had a great time. For your information, if you are thinking of staying overnight at shelter 5, beware of the wild boars. We saw and heard 3 tents destroyed by them. One more thing, I lost a half of my toe nail because the (nearly) 35 km walk that I did in one day. 🙂 It was a super long happy walk. Next post 15 Things to do in Solo. No. 10 is my Favourite! Chocky! Kamu kan udah pernah ke Nepaaaallllll.. Aku pun envy! Hi, I will be travelling alone through Indonesia. Is it possible to climb Mount Tambora solo? I’d be happy to join other groups. So, is it likely that if I show up in near Tambora I can find other groups to go with? What do you think? I think it should be possible to climb the mountain by yourself, but I would recommend in getting a guide. Maybe try to arrange something from Lombok (if you stop by on the island before going to Sumbawa, Tambora) for your Tambora trip. It is pretty common to arrange a trip to Tambora from Lombok. All the best for the trip!